I can't even begin to tell you how amazing my husband can be! We have this thing, one week I schedule a little something to do the next week, is his turn. It can be little like a picnic or, a movie. 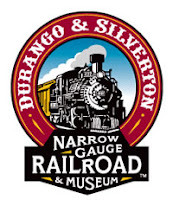 This time my husband planned an early anniversary trip and took me up to ride the Durango & Silverton Narrow Gauge Railroad! My weekends happen to be on Wednesday and Thursday so, David and I left to head to Durango, CO on Wednesday afternoon (later than we wanted because of a situation that I'm sure he'll cover in his blog). We had a lovely uneventful drive (the second time we left, you really should read his blog) and arrived in Durango around 5:00. We checked into our room, and the headed over to eat dinner at Serious Texas BBQ. If you have never eaten there, you totally should! It's not exactly on the primal eating list but once in a while, you can make different choices. And this, was one of those times! We then walked around down town then headed to the hotel for an early turn in because we had to be up early to catch the train. The next morning I was up even before my alarm! Growing up we always saw the old steam trains pass by our house but, I had never done anything like this before and I was very excited to finally get to ride a steam train! We arrived at about 7:30, hopped on the train in Durango and it started off promptly at 8:00. The 3 1/2 hour ride up to Silvertion, CO was beautiful! The train went through some of the most beautiful country I have EVER seen filled with wildflowers, river canyons, trees and mountains! You could almost imagine what it would have been like to be taking a steam engine at the turn of the century. We arrived in Silverton around 11:30 and had a couple hours to eat some lunch and wander around this old and beautiful mining town. Our fist stop of course, was lunch so we chose to eat at a restaurant that was inside a building that used to house a bordello. The food was excellent and since we sat on the patio, we were also treated with some live music. I don't know the name of the man singing but his voice was absolutely amazing. I did my best to try to choose a lunch item that was healthy and within my parameters of things that I eat. We then wandered through the town and shops and took lots of pictures before heading back to the bus to return to Durango. In retrospect, we wish we would have also ridden the train back down to town instead of taking the bus however, the bus ride was nice and the driver was very knowledgeable about the area. We were not disappointed. Thanks for the GREAT trip! We definitely have to do this again! Sounds like you picked a perfect time to go! The only time I have gone, half of the group rode the train up, the other half rode in a car. Traded tickets for keys @ lunch. Great option and not so long a train ride. Ken, it was the PERFECT time to go! Not too hot, not too cool. And just beautiful! Beautiful pictures! Thanks for sharing!!! Thank you so much! It was a lovely trip!